The Gemini are distinctly noticeable twin stars to the northeast of Orion. Of the two -- Castor and Pollux -- it is Pollux (beta, farthest east) which is the brighter. The constellation has a fine star cluster for binoculars and a number of interesting binaries. Alpha Geminorum (Castor, The Horseman) is a wonderful multiple system of six components. The twins Castor and Pollux were known from antiquity and even featured on coins in Greece and throughout the Roman Empire. Romans knew them as the Sons of Zeus. Gemini is one of the more easily found constellations, found to the northeast of Orion or due north of the bright and solitary Procyon. From the brightest star in the Winter sky, Sirius, describe a curving line northward, through Procyon and then slightly westward to the twin stars. Castor and Pollux are in the same FOV. Castor is pale blue and Pollux is orange (or yellow). Pollux is actually the brighter of the two stars, 1.2 compared with 1.6. In the same FOV as Castor can be seen tau Geminorum to the west. This is Castor's 'chest' and from this point two outlying stars mark his hands: theta Geminorum to the northwest and iota Geminorum. Iota is the one common star between the twins, forming the right hand of Castor and the left hand of Pollux. Delta Geminorum is a pleasant creamy-white star with a much fainter orange dwarf with an orbit of about 1200 years. 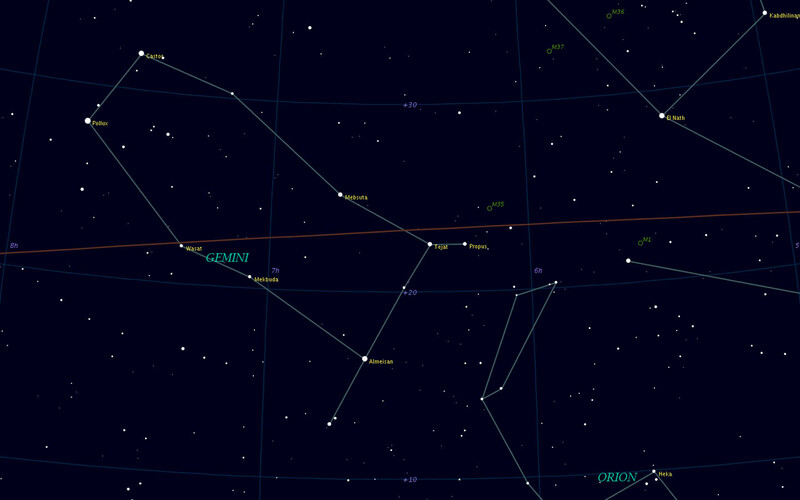 Its orbit shows that the companion is presently about PA 225� and separation 5.8". As the companion is so faint (8.1), it can only be resolved in large telescopes. Delta is the mid-riff of Pollux, ten degrees south of Castor. Southwest of delta is the very difficult Eskimo Nebula (NGC 2392), impossible for binoculars. To the northwest is the long-range variable R Geminorum, which brightens from about 14 to around 6 every 370 days. Gamma Geminorum is Pollux's left foot, and the third brightest star in Gemini. To find gamma, start at Procyon. With the naked eye you'll find a triangle formed by Pollux to the north and Alhena (gamma Gem) to the northwest. In binoculars you'll see its attendant star, xi Geminorum. Now if you draw a line from xi, through gamma and to the northwest, you'll encounter mu Geminorum, the left foot of Castor. (Or just move the binoculars up, putting gamma at the bottom of your FOV; mu will be at the top.) We can now fill in the rest of Gemini's details. From Alhena (gamma Gem), move half way up to Pollux. This is delta Geminorum (Wasat, The Middle). Mu Geminorum is Castor's left foot. In the same FOV can be found the only Messier object in Gemini, M35, a fine star cluster. To find mu, move northwest a little over one field of view from gamma.